Melbourne based anarchist, revolutionary networker and "Urewera 17" supporter Sina Ana Brown-Davis is returning to Auckland to lecture on revolution in the Pacific. She is being hosted by the Auckland Anarchist network and Socialist Aotearoa, a recent split from Socialist Worker. 6:00pm - 8:00pm @ Clubspace, above the Auckland University Quad. Sina Brown-Davis, Melbourne-based Maori, Tongan & Samoan anti-globalisation and solidarity activist will be giving a public talk on revolutionary struggle and activism in Australia and the Pacific. 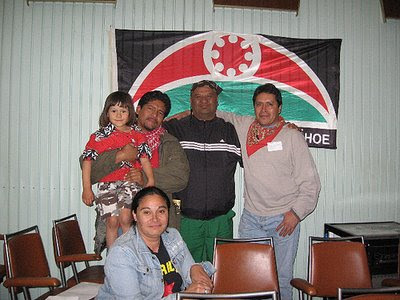 Sina works closely with Aboriginal Australians in a number of anti-racist and anti-colonial projects and campaigns. She runs uriohau.blogspot.com a news service for activists and revolutionaries throughout the Pacific. Sina was one of two-dozen activists arrested in the wake of riots at the G20 neo-liberal economic summit held in Melbourne in 2006. Sina will be discussing her experiences in and perspectives on anti-capitalist and anti-colonial struggles in Australia and the Pacific. Sina is visiting Aotearoa to build solidarity and support between indigenous and radical activists who on both sides of the Tasman are being targeted by state repression. No one sees the irony of someone describing themselves as "Maori, Tongan & Samoan" also being for "anti-globalisation:?